Fiona Boler is a student at University of Winsonsin- La Crosse and an ISA Featured Blogger. She is studying abroad with ISA in Bangkok, Thailand. “Magical.” “Out of this world.” “The most beautiful thing I have ever experienced. “ These are the reaction that myself and many others shared during the Loy Krathong and Yi Peng festival in Chiang Mai. Loy Krathong is celebrated throughout Thailand, on the evening of the full moon of the 12th month in the traditional Thai lunar calendar. The festival is to honor the river goddess, give thanks for water and apologies for polluting it. Krathong’s, made from banana tree trunk and leaves, is held together with pins and then decorated with flowers. The Thai people then send them floating down the river. 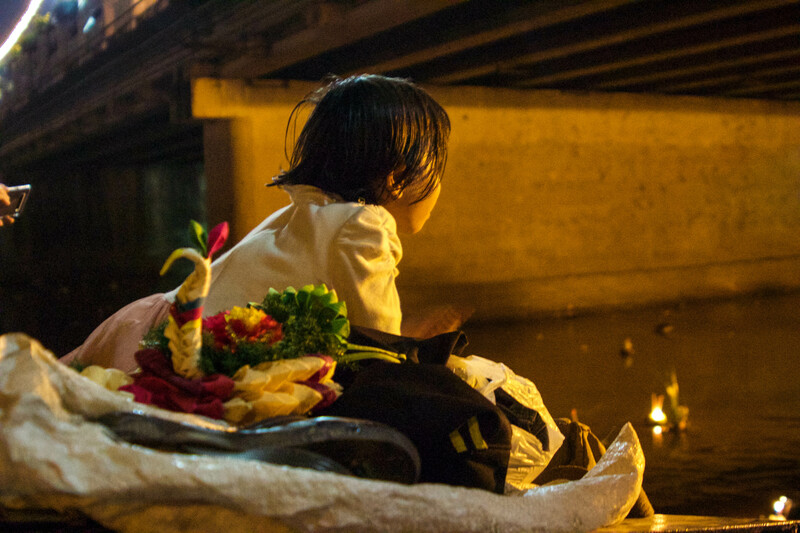 Ping River, Child watching the Krathong’s float down the river, with her Krathong siting right next to her. Chiang Mai, Thailand. 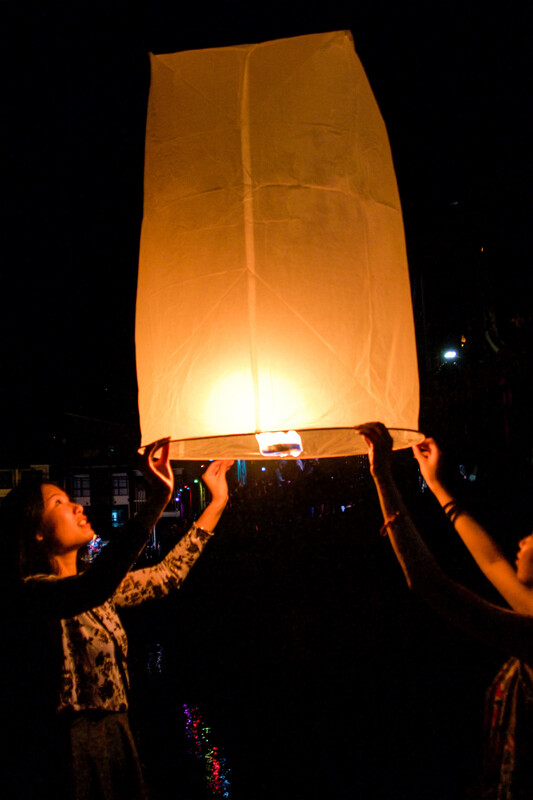 In Northern Thailand, the Yi Peng festival falls on the same day as Loy Krathong. The Yi Peng festival lanterns are made from rice paper. They are then lit and floated into the sky, each one carrying a wish into the heavens. It was already dark when I got into Chiang Mai. My hostel was about a 10-minute walk from the Ping River, where the main part of the festival was taking place. The first thing I remembered seeing was the moon. The moon was full, and bright, illuminating the sky and drawing your eye right towards it. 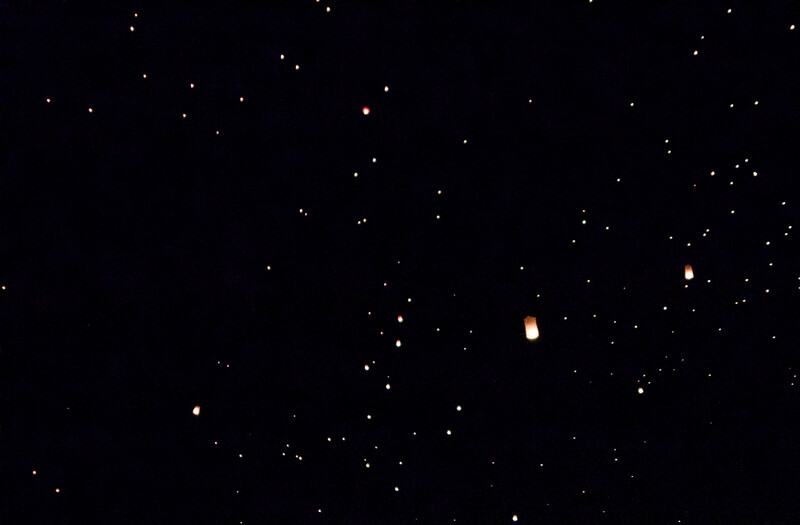 Next I noticed the lanterns… first there were only a few in the sky and then, as we approached the river, more and more floated into perspective. I watched in amazement as they floated past the full moon. When I looked to the river, hand made Krathongs floated past, creating a absolutely magical scene around me. Iron Bridge, two people about to let their lantern float up into the sky. Chiang Mai, Thailand. The sky filled with lanterns. Chiang Mai, Thailand. After I lit my lantern, released it and made a wish I was ready to escape the chaos and find a less populated area to admire the sky. 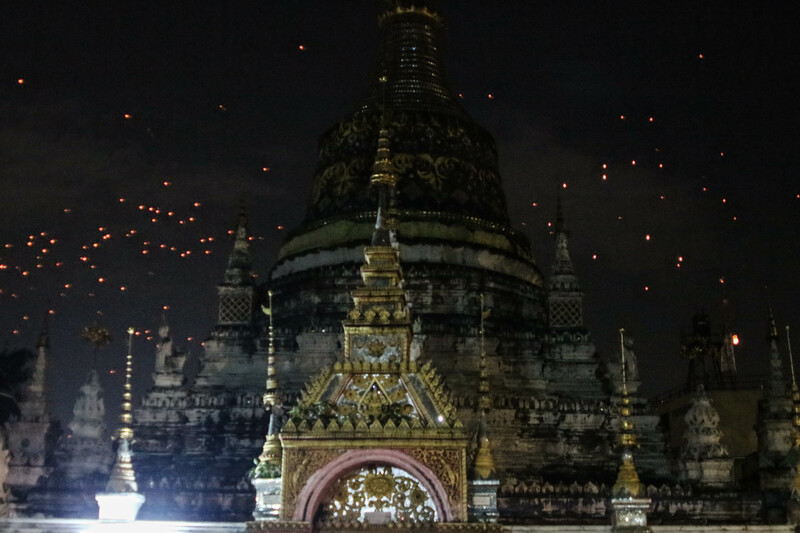 I ended up at a temple within the city where a few monks were celebrating by lighting off small fireworks, playing with firecrackers and sending their own lanterns into the sky. Watching the lanterns float past the temple and then seeing all of the sky lit up behind it was more beautiful than any photo could capture… but of course I tried! 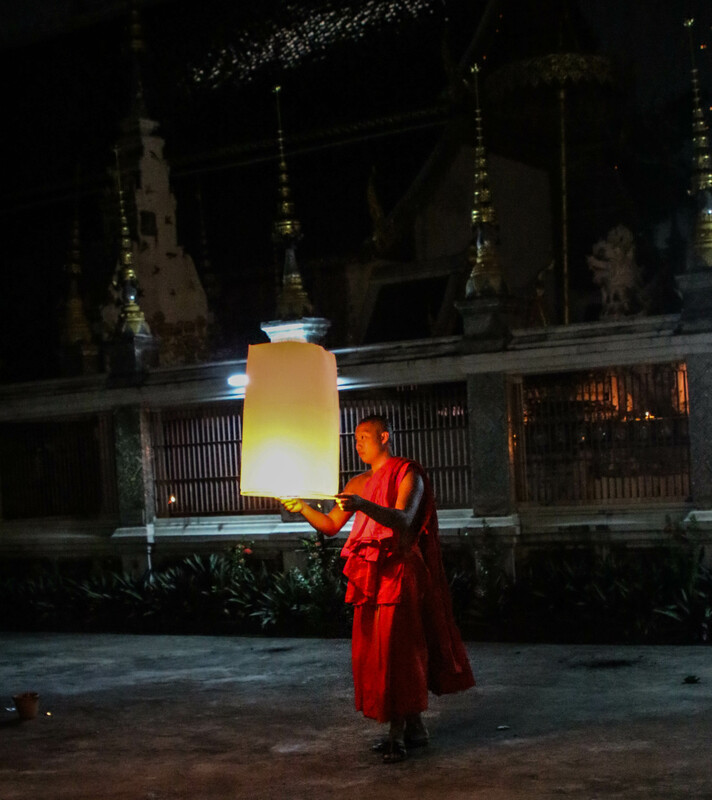 A monk lighting off his lantern at the temple. Chiang Mai, Thailand. A Temple with lanterns floating in the background. Chiang Mai. The next night was the Loy Krathong Parade. As I have always been a fan of parades, I was excited to witness their expressions of culture. 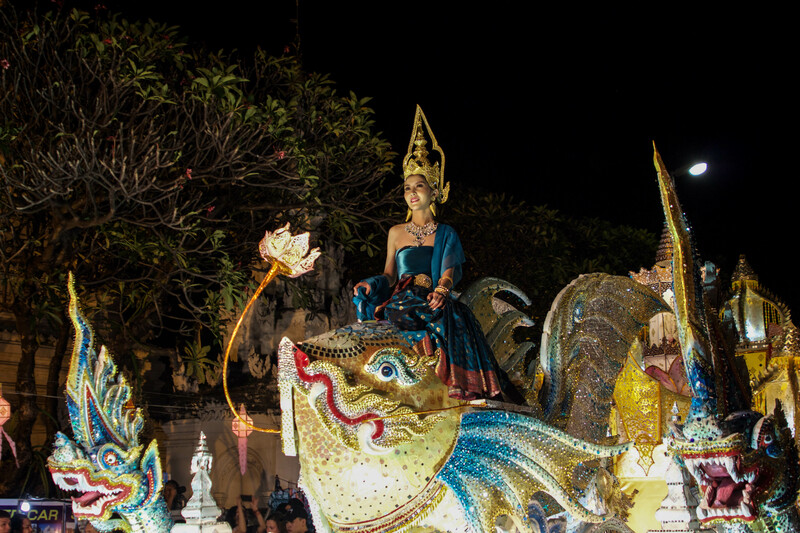 The parade was a combination of floats telling stories of river goddesses, The Buddha, and Thailand itself. There were also an abundance of pageanters , traditional Thai music and much more. There were so many extravagant floats, talented performers and all together participants in the parade, it was all together an entertaining and beautiful production. Loy Krathong Parade: Giant fish float, with the “goddess of the river” ontop. Chiang Mai, Thailand. 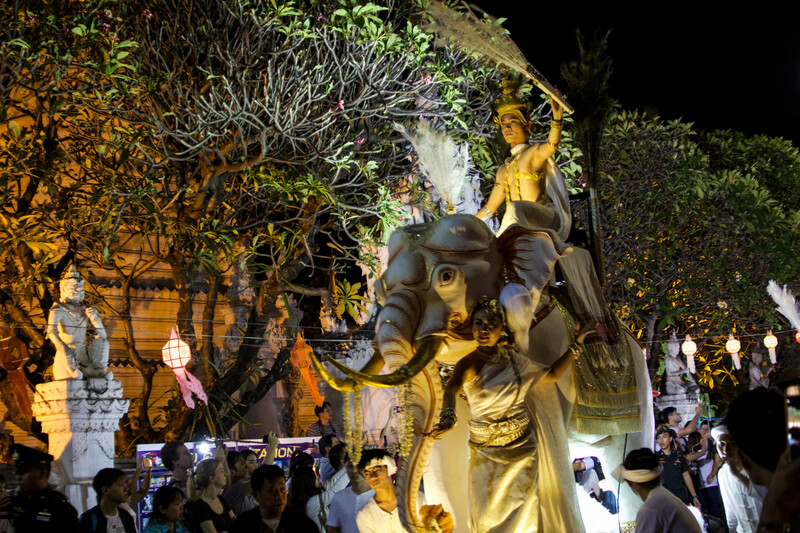 White Elephant float, a sacred and royal symbol of Thailand. Chiang Mai, Thailand. 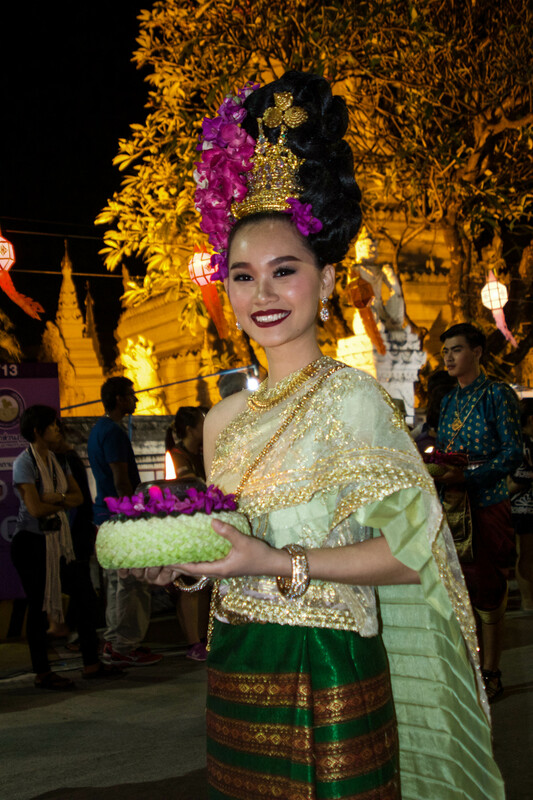 A Thai woman dressing in traditional garb holding a lit Krathong. Chiang Mai, Thailand. Being able to experience and participate in these beautiful festivals was one of my most enjoyable moments here in Thailand. The city of Chiang Mai itself is surrounded by mountains and has a laid back, wondrous sort of energy. I wasn’t sure what to expect, and when I arrived no one could have prepared me for the beauty of what I would experience next.